The Sarjeant Gallery’s new acting registrar, Ben Davis, has a diverse background tailor made for the role. 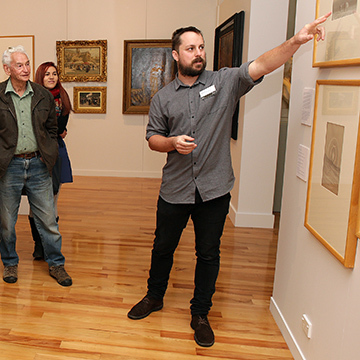 He was one of four Collection Transition Assistants who helped move over 8000 artworks from the historic building on Queen’s Park to the temporary premises on Taupo Quay. Mr Davis also worked for many years in his home town New Plymouth at Puke Ariki museum, the Govett-Brewster Art Gallery – Len Lye Centre and as an arts and design technician for the Western Institute of Technology at Taranaki (WITT) where he worked with tutors and students making resources and mounting exhibitions. Mr Davis has a Bachelor in Visual Arts, majoring in Fine Arts, a certificate in photography and trained at a film school for a year. It was at Puke Ariki where he met his partner, Sarjeant Gallery Registrar, Te Maari Barham who is on maternity leave for eight months. So being a father is another exciting, new role this year.In his student days he worked at the Govett-Brewster Gallery as a host and front of house then later at the Gallery and Len Lye Centre mounting and dismantling exhibitions. The experience over a number of years showed him how transformative the new Centre has been. During his time as Collection Transition Assistant Mr Davis also assisted with mounting exhibitions and wrote several articles that give personalized glimpses into the collection. Mr Davis admired the watercolours of Dr Edward Wilson, a physician, natural historian, ornithologist, and artist who died with Scott on his last expedition to Antarctica. The Sarjeant holds fifteen lithograph prints of the accomplished watercolours Dr Wilson painted on the two expeditions he made. Mr Davis’s articles are on the Sarjeant Gallery website, which is a portal to the collection. Now, as acting registrar, Mr Davis has been getting up to speed with the processes involved in receipt and dispatch of the artworks, and checking their condition when they have been exhibited in Sarjeant on the Quay, or are lent to and returned from other galleries. Collection management processes are however familiar territory to him. For five years he worked on the Swainson-Woods collection of studio photographs of Taranaki people 1923 – 1997, cataloguing and scanning the photographs to make them available online. He has worked on contract at other museums around the country, including Auckland Museum and the Museums of Transport and Technology, and Maritime Museum and is thrilled that he and Ms Barham have been able to return to Whanganui and the Sarjeant.The Sarjeant has a much smaller team so his experience with collection management, photography, installing and dismantling exhibitions is the kind of broad skill base the Gallery needs.